Stocks are mostly flat in midday trade following yesterday’s breakout. Those with cash aren’t buying and those with stock aren’t selling. Contrary to popular opinion, complacency is bullish because confident owners don’t sell and that keeps supply tight. It only becomes a problem when we run out of buyers needed to sustain these levels. So far this year market participants have been unwilling to chase stocks above 1,900 and we drifted sideways the first five months of the year. Here we are again at the top of the trading range and asking ourselves if this is finally the real breakout, or yet another stall near the highs. Last year’s relentless rally forced fund managers to buy a market they didn’t trust because they were more afraid of being left behind. This year the market is only up 3% over the first five months and there is very little pressure on managers to chase performance. In fact we are seeing the opposite in speculative names as everyone is trying to get them off their books. But while tech stocks stumbled, the S&P500 and Dow are making new highs. The biggest reason for the disconnect is few of these new issues are old or large enough to have been added to these broad indexes, so their selloffs doesn’t affect them. But are these canaries in the coal mine and foretell doom and gloom for the rest of us? It is easy to find bulls and bears in this market. Depending on who you talk to, things are either great or about to implode. The most scarce opinion is indifference toward this market. In 2014, both bulls and bears have been wrong at every turn and the traditional summer doldrums are an unlikely place to break this logjam. Buying weakness and selling strength has been the trade of the year and there are no signals this will change as we move into summer’s traditionally slow trade. With the markets largely flat for the year, there is little pressure on managers to buy record highs and this gives them time to wait and see what happens. Without big money getting behind this breakout, it is hard to see what else will propel us higher. If this market continues rallying, that will pressure managers to chase. While this is a more likely outcome this fall, it could happen earlier if we keep making new highs. Buy weakness and sell strength. 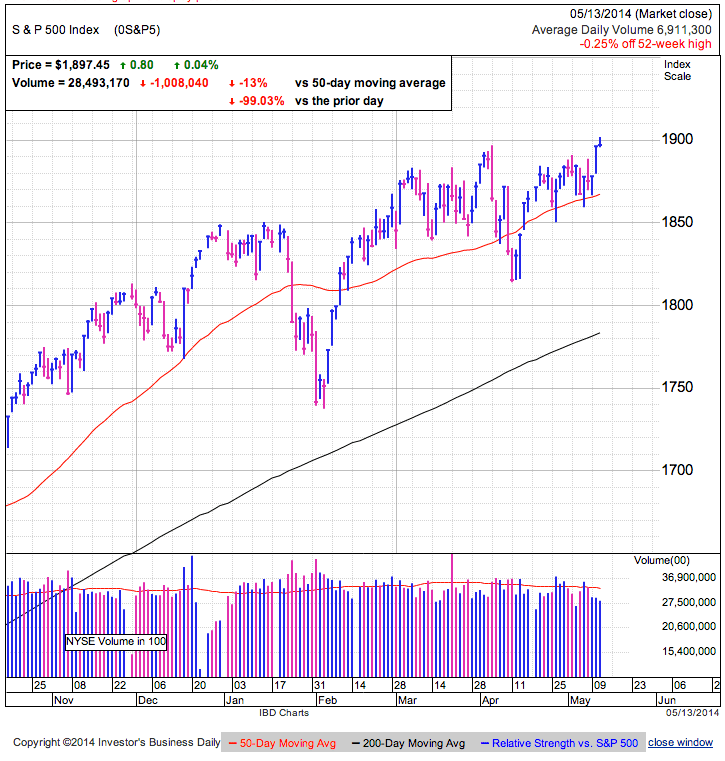 The S&P500 surged to new highs, decisively breaking the 1,900 barrier. 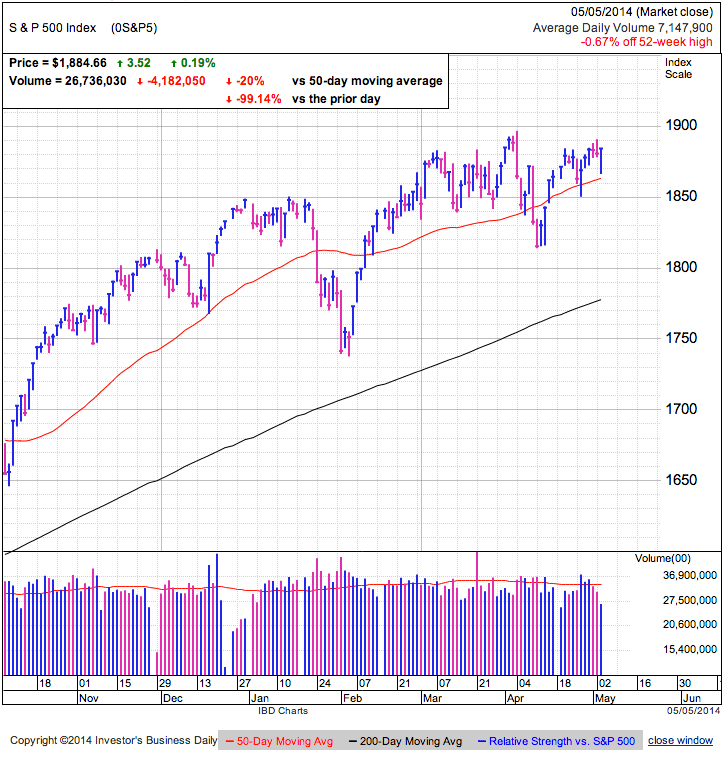 Volume was below average, but above last week’s lethargic pre-holiday levels. Either this is the start of the next rally leg, or one last gasp before demand dries up and we slip into the traditional summer doldrums. Today’s breakout was largely derived from European strength following expectations of more monetary easing by the European Central Bank. While easy money is drying up in this hemisphere, the party continues on the other side of the globe. In reality, this is a half-empty/half-full development. Markets are addicted to cheap money, but central bankers reliance on stimulus shows these experts don’t have confidence in the underlying economic fundamentals. Supply and demand wise, lighter holiday volumes make it easier for smaller trades to move the market. Today we broke through well-defined technical levels, causing many traders to buy the breakout and/or cover their shorts. Every other time we approached these levels, demand dried up as few buyers were willing to chase these prices. Will this time be any different? 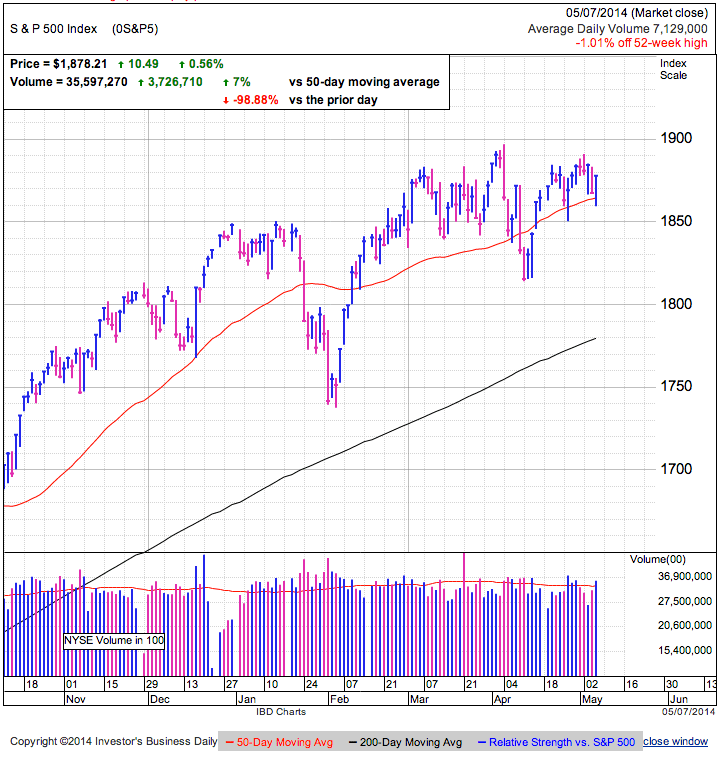 Market rallies are built on stocks recovering from oversold levels following a bout of irrational pessimism, or they coast higher on complacency and the assumption good times will continue indefinitely. Its been a long time since trade was dominated by fear and pessimism, meanings this strength comes from the assumption of good things to come. The best trading opportunities come from going against the herd. If the herd believes we have nothing to worry about, then we should be worried. Expectations of clear sailing mean most are fully invested and the lack of fear means there is ample capacity for a wave of panic to take hold. Expected Outcome: At the upper end of a summer trading range. Big money managers often take time off in the summer and the junior associates rarely have the authority to initiate new positions. This lack of demand is why summer volumes are often light and we typically trade sideways. With so many managers dreaming of the beach, it seems unlikely they will chase this market, especially since we are mostly flat for the year and there is no pressure to keep up. Traders have an intrinsic fear of heights and while they are not fretting over headlines, these record highs make them nervous. That reluctance to own makes the market under owned and will be the catalyst for the second half of the year rally. Buying breakouts and selling weakness has been the surest way to financial ruin in this choppy, sideways market and so far we haven’t seen anything to suggest this breakout will turn out any different. Until proven otherwise, buy weakness and sell strength. Stocks took it on the chin as they crashed through the 50dma in early trade, but just managed reclaim this widely followed technical level by the close. 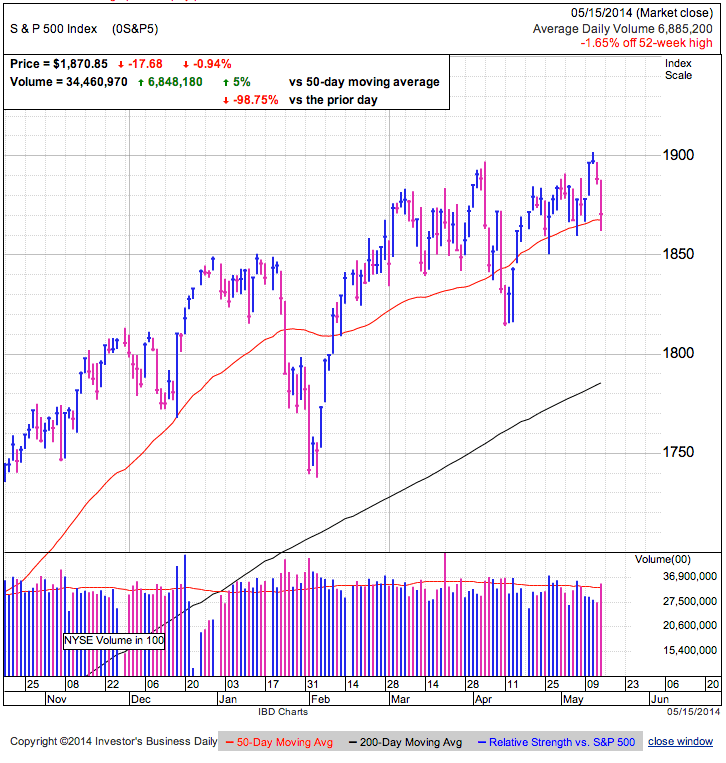 Thursday broke the string of apathetic trade and finished in above average volume. This is the third time we tested the 50dma in recent weeks and up to this point buyers have come to the market’s rescue. The 1,850/1,900 trading range is alive and kicking despite repeated attempts to depart it. Neither bulls nor bears built the critical mass necessary to sustain a move out of this range. Every time demand evaporated near 1,900 and supply vanished near 1,850. Today’s move pushed us into the lower half of the range where dip buyers snapped up shares and stopped the selloff just under the 50dma. For bulls it is encouraging to see selling stall instead of accelerate after violating an important moving average. That shows many traders are more willing to buy and hold these levels and few were rushing for the exits. But selling pressure is only half the equation. 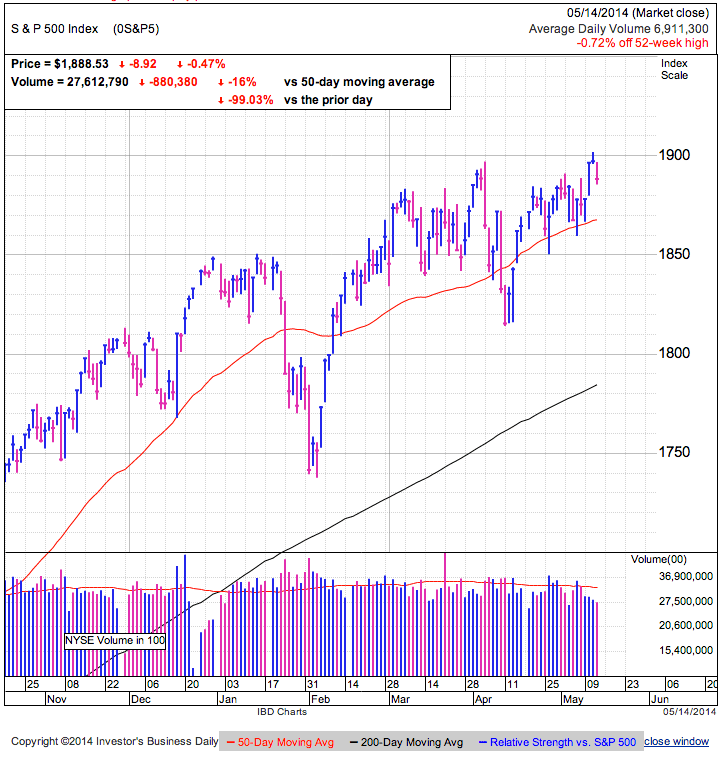 While most owners are content holding stocks at these levels and their confidence prevents days like today from turning into a stampede for the exits, the bigger concern is those with cash remain reluctant to buy 1,900. Tight supply is always helpful, but lack of demand trumps it every time. If bulls cannot persuade those with cash to buy these highs, eventually the market will crumble under its own weight. Expected Outcome: Falling back into the heart of 2014’s trading range. 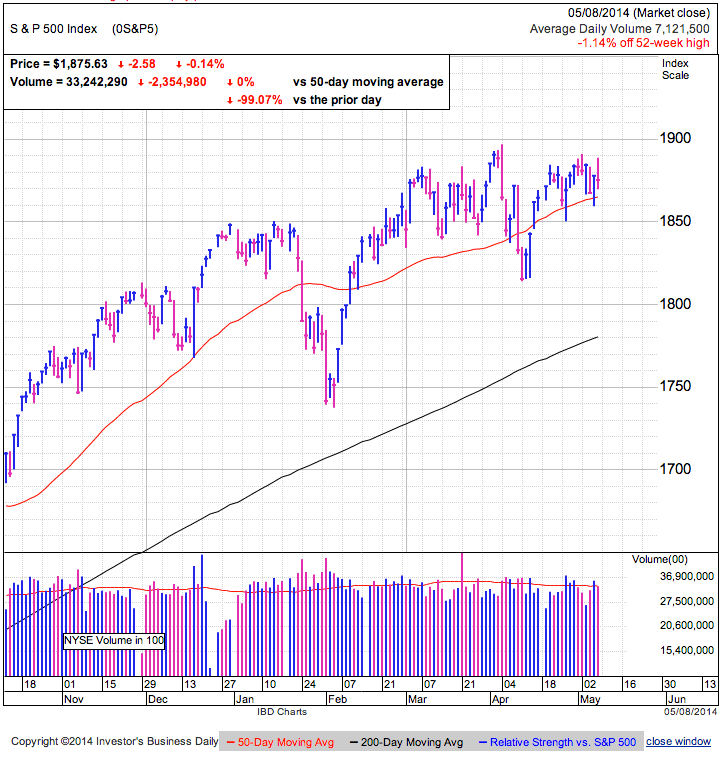 While stocks might bounce temporarily off the 50dma as a small contingent of eager dip-buyers dive in, larger pools of money remains reluctant to chase these record highs. This is further compounded as we move into the slower summer season. Without buyers, expect this dip to continue. But don’t mistake these normal market gyrations for a crash. So far there is nothing to suggest this is the 10 or 20% correction bears have been calling for. If we cannot hold 1,850 we will likely test the 200dma, but that would be a better place to buy stocks than press a short. Every dip this year has been a buying opportunity and each time the size of the selloff shrinks as buyers rush in sooner and sooner. It was a 100-point dip in January. April saw a 75-point selloff. And so far this one has gone 40-points. If the selloffs continue getting smaller, we likely saw the worst of this move. Expect dip buyers to temporarily prop up the market near the 50dma, but few value investors will be seduced by a 1.6% discount from all-time highs. We likely need to fall further before those with cash find deals too good to resist. If the market bounces Friday, it is a better place to close out long positions than buy the dip. Stocks slipped from record highs on ever decreasing volume. The market closed under 1,890 after topping 1,900 for the first time on Monday. But just as interesting is how this was the fifth consecutive day of declining volume and finished as one of the lowest volume days of the year. 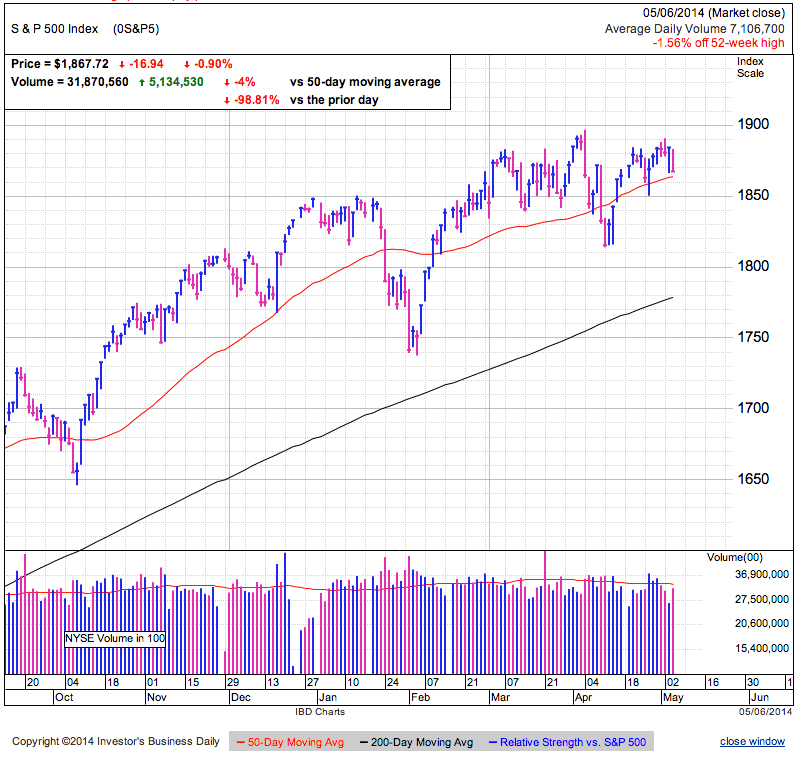 The market is at the upper end of the recent trading range and still well above prior support at the 50dma. 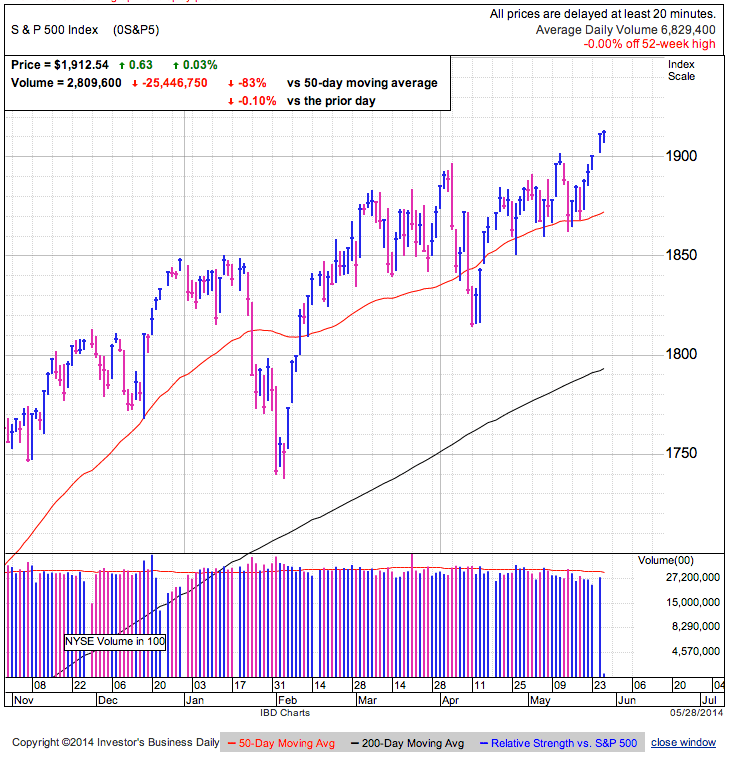 Stocks continued 2014’s trend of stalling as we push toward 1,900. The market is clearly attracted to these levels as it keeps coming back to them, but it never mustered the follow through necessary to break past this milestone. Monday’s historic trade was all the excuses a tightly coiled market needed to explode higher in a frenzy of breakout buying and short covering. The fact that we stalled and pulled back shows us that the market is not in the mood to explode higher. This is valuable information for any trader that trades risk/reward. If we eliminate explode higher, that leaves us with grind higher, grind lower, and collapse lower. Two of the three are negative and one is extremely negative. Given the outcome skew to the downside, this is a less favorable place to own stocks, let alone buy them. Volume remains exceptionally light as few are changing their mind. Those that own stocks keep holding and those with cash remain disinterested in chasing. While it is encouraging to see the market continue holding these levels, if we cannot find buyers soon, the market will fall under its own weight. Bulls had the perfect setup to extend the rally, but the market failed to take the bait. Without explosive upside, at best the market will grind higher and it only gets worse from there. It is hard to justify owning risk here with such limited upside. The most bullish outcome will be trading sideways until the rally resumes in the fall. If that’s the case, we don’t get paid to own risk (ie stocks) over the summer. When in doubt stick with the trend. This is the bull that just won’t die and it is far more likely to continue than reverse. The best trade of 2014 has been buying strength and selling weakness and this market is not giving off signals this is changing here. Anyone sitting on profits should lock them in and for the aggressive, this is the best shorting opportunity in some time. But don’t mistake a normal and routine dip back into a trading range for a market collapse. Counter trend trading is the hardest way to make money in the markets and bears should take profits early and often. Stock broke 1,900 for the first time in history, but only held that level for an hour before settling back into the high 1,890s. Volume was again lower as fewer people are trading these levels. The breakout to record highs failed to trigger a surge of buying and the day largely passed with a yawn. Venturing into social media shows how married people are to their outlook and unwilling to change regardless of the evidence. There is nothing thoughtful or insightful coming from most people, but the intelligent trader can use these clues to look under the surface. Markets move when people change their mind. They adjust their portfolio to reflect their new outlook and this buying and selling moves markets. But when market participants are so stubbornly entrenched, we trade sideways because no one is changing their mind. Threats of war in Eastern Europe don’t give bulls pause just like the strongest hiring binge in two years doesn’t sway bears. This behavior means headlines no longer matter since both sides refuse to acknowledge anything that contradicts their preconceived bias. If news won’t sway traders, what will move this market? Boring old supply and demand. Everyone knows markets go up and down, but most people identify with bulls or bears and assume any move in their direction will keep going. But the truth is the market trades sideways far more often than it makes directional moves. 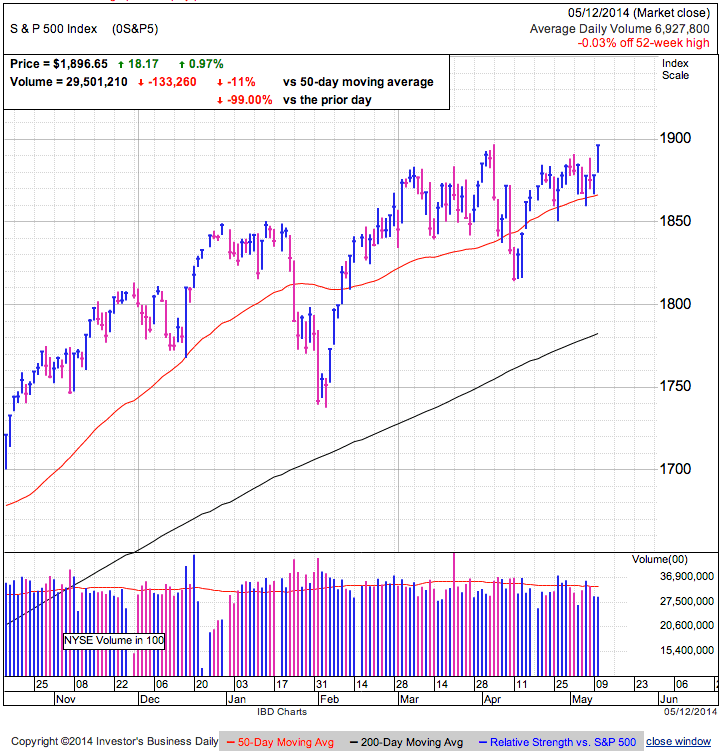 While tight supply driven by owners’ confidence and unwillingness to sell pushed us to record highs, dwindling volume suggests few are willing to buy the breakout and this market will likely stall on weak demand. Summer is a historically lethargic season and the market will likely continue trading sideways for months to come. Expected Outcome: Running out of steam at the upper end of a trading range. Markets broke 1,900, but it didn’t trigger a frenzy of breakout buying or short covering. At the same time it didn’t set off a wave of profit taking and shorting. Most likely the market will continue trading sideways until something comes along to shake this gridlock. Either that will be panic over some kind of economic calamity or buyers will venture back in when nothing bad happens for an extended period of time. Until then, the best trade remains buying weakness and selling strength. The move to record highs makes this a better place to lock in profits than initiate new positions. Consolidations clear the way for moves higher. Most often they are pullbacks, but often sideways trade is all it takes to refresh a market. Stocks had a good day as the S&P500 made a record close and the NASDAQ continued its bounce off the 200dma. Volume was restrained and the lowest we’ve seen in recent days. This move to record highs dumbfounded bears who remain convinced this market should have imploded months ago. Where does this strength come from when so many distrust this market and Eastern Europe is on the verge of war? The answer pretty straightforward, confident owners. Contrary to popular opinion, complacency is bullish because confident owners don’t sell and that keeps supply tight. We’ve seen a bloodbath in the most speculative stocks, but a 30% pullback in many of these names only drops us back to levels from a few months ago. When a stock goes up 50% in a short period, 30% pullbacks are normal and should be expected. While I don’t buy into the doom and gloom scenarios flying around, it is hard to get excited about this market. We are approaching the summer lull and it will struggle to find strong demand when big money managers are on summer vacation.. The most likely outcome is the market will remain range bound until fall, but since we are at the upper end of the range, we could easily see a 50 or 100-point selloff and still be within it. While we could easily break 1,900 on Tuesday or later this week, how we trade after is what matters. The most bearish scenario is a frenzy of breakout buying and short covering that launches us through 1,900, but those gains quickly evaporate as wider demand dries up. Failing to hold the breakout likely means we will retreat back into the heart of the trading range. The more people distrust this market, the more bullish a contrarian is. While there are plenty of reasons for this market to sell off, we cannot ignore its strength. When the market disagrees with us, we are the ones who are wrong. This market struggled with 1,900 all year and this time will likely not be any different. Given the limited upside during the traditionally slow summer months and the material downside if we slip back into the heart of the trading range, it is hard to justify the risk/reward of owning here. This is a safer place to be taking profits than buying the breakout. If we hold 1,900 I’ll reevaluate, but if it fails to hold this level, I’ll look closely at shorting the move back into the trading range. Stocks took investors on another wild ride. This time we surged higher midday but gave it all back by the close. We are seeing enthusiastic moves, but few last more than a couple of hours as we remain stuck between 1,860 and 1,890. So far the market is holding above the 50dma, but there are only so many times we can test it before it gives way. This market has everyone chasing their tails and reactive traders are getting carried out in body bags. The problem is most of the market is trading with a bias. Bears sell every dip and bulls buy every rally. With these whips, that guarantees buying high and selling low. The reason we are stuck in this range is each side is so entrenched that war with the worlds largest energy producer or the best employment report in years is enough to convince people to change their stubborn outlook. Bulls are bullish and bears are bearish regardless of what is going on around them. Why this matters to the rest of us is markets only move when people change their mind and start buying or selling to reflect that new outlook. I have no idea what will break this logjam, but it needs to be bigger than war or the strongest hiring binge in years. Summer is often a slow time of year because most big-money decision makers are on vacation and the junior traders don’t have the authority to initiate large positions. Expect the sideways trade to last until everyone comes back in the fall. But since we are at the upper end of the recent trading range, sideways could include a 100-point dip to the 200dma. As turbulent as recent trade has been, the longer we hold these levels, the more likely it is the resolution will be to the upside. Anyone who’s been reacting to these swings has been getting chewed up. Without an exploitable edge, the best trade is to not trade. Unless buyers step in to save this market, expect it to fall back into the heart of the trading range, but without a fundamental catalyst this won’t lead to the larger correction many are calling for. It was another whipsaw day. We gapped higher at the open, crashed through the 50dma within an hour, bounced back into the green by midday, and finally closed at the high of the day. We covered over 50-points in this back-and-forth and continue the trend of violent intraday moves. This was the third dip under the 50dma in the last 30-days. Each time we bounced back, but there are only so many times a bull can tempt fate. While it is encouraging to see the market bounce off the 50dma, sustainable rebounds typically explode higher and don’t look back. This one keeps stalling after the brief dip-buying frenzy abates. Lack of follow through suggests few with cash are willing to spend that money near record highs. The market has been buoyant on the confidence of owners who are unwilling to sell regardless of headline risk or weak price-action. The lack of owners rushing for the exits keeps supply tight and makes it easier for modest dip-buying to prop up the market. But if we keep running out of new buyers every time we approach 1,900, even tight supply will not be able to save this bull. This market feels fragile. We had the best employment report in two years, but prospective buyers were unimpressed and instead focused on the half-full fine print. If they wouldn’t buy that headline, I cannot think of anything else that would get them excited enough to bid up prices. If good news leaves us flat, it makes me nervous to think about what would happen when we get bad news. With so few active buyers, it wouldn’t take much selling to send prices tumbling lower. Limited upside and huge downside is a great place hold cash. Making money in the markets is easy, the hard part is keeping it. The key to long-term success is not giving back our profits by forcing a trade when we don’t have an edge. The longer we hold these levels, the more likely this consolidation will breakout to the upside. It feels like we are skating on thin ice and it is best to leave this market to the gamblers. The disciplined trader will wait for the odds to fall in his favor. If something spooks this market, that could finally trigger the selloff everyone’s been waiting for. But since momentum is higher, it is best to wait for the first cracks to form before trading against the up-trend. Stocks slipped nearly a percent and find themselves just above the 50dma. Volume recovered from Monday’s lethargic levels and was back near average. Monday’s bounce off the 50dma lacked broad participation as shown by the anemic volume. Today we gave it all back when buyers failed to step up and defend these prices. While most owners are confidently holding stocks and not selling this weakness, it is becoming harder and harder to find people willing to buy near record highs. Many think the escalating situation in Ukraine will lead to further weakness, but the market has long priced in Ukraine and it is already ancient history. Anyone who understands politics knows neither Putin nor Europe can afford to impose material economic sanctions or embargoes on each other. Both sides need each other too much and while these events grab headlines, they will have little consequence to corporate earnings in this country. The market rallied when Russia invaded and captured Crimea and eastern Ukraine is just as economically trivial. Anyone who fears these headlines sold weeks ago and there is no one left to sell the escalation. But just because one thing doesn’t cause something else doesn’t meant they are not correlated. (causation, correlation, and coincident) While few owners are actively selling these headlines, it is one of many reasons prospective buyers are not in the mood to bid up prices. Tight supply can hold the market up for a surprisingly long time, but there comes a point when even that cannot compensate for diminishing demand. Right now it feels like we are approaching that point. As we creep toward the summer season, many senior money managers at big institutions are getting ready for summer vacation and not in the mood to initiate new positions. This is why more often than not summer trading is so unremarkable. While the senior decision makers are on vacation, big money doesn’t buy or sell in material volumes. This means we will likely drift sideways until they come back to work in the fall. Of course “sideways” is relative and simply means staying within the recent range between 1,750 to 1,900. While a 150-point dip still technically counts as sideways, that is anything but boring. Last Friday’s stronger than expected employment report was more than enough excuse to jump-start this bull if it was poised to surge higher. The fact that we stalled instead shows few are willing to buy this market no matter how encouraging the headlines, so it appears like prices need to come down a bit before new money will venture in. This is far from the crash many are predicting and is little more than a normal and healthy dip back into the heart of 1,800/1,900 trading range until this fall. Volatility and headline uncertainty is flushing out anyone with a weak stomach. This churn refreshes the market and leaves us with a solid foundation of confident owners who are unfazed by negative headlines or modest weakness. When they refuse to sell, that keeps supply tight and props up prices. Even when demand is light, prices continue to rise if supply is even more scarce. Near record highs is a better time to be taking profits than adding to positions. Long-term holders should sit through the sideways trade, but they would be better served waiting for better prices before adding to their favorite positions. Swing traders should already be taking long profits and watching for a short entry. Shorting a bull market is one of the hardest ways to make money, so be nimble and take profits early and often. Stocks gapped lower at the open, but recovered those losses before midday. Early weakness bounced off the 50dma, holding this widely followed technical level. Volume was one of the lightest of the year and shows few were participating in today’s move. Early weakness was driven by escalating conflict in Ukraine, but so few people sold the news that we bounced back in little more than an hour. But at the same time, just as few people bought the dip, showing there isn’t much engagement in this market on either side. Most who own this market are content holding and those sitting in cash are uninterested in buying in. While the reluctance of owners to sell kept supply tight and propped up prices, we are starting to see signs demand is falling off. This market has stalled multiple times in the upper 1,800s and has been able to break through the 1,900 barrier since early March. Normally consolidation is constructive and suggests higher prices, but Friday’s lethargy following one of the strongest employment reports in multiple years shows few are willing to pile into this market near record highs. While many claimed the headline beating employment numbers were undermined by the fine print, that was just the excuse people used to avoid buying this market. While the market recently maintained a half-full outlook, the way it responded to this employment report was definitely half-empty. Contrary to popular opinion, complacency is bullish because it means few owners are interested in selling no matter what headlines come across the wire. The resulting tight supply is a big tailwind for prices. But supply is only half the equation. Weak demand trumps tight supply and there are signs we are approaching this tipping point. If no one wants to buy, prices fall no matter how confident and optimistic owners are. Expected Outcome: Momentum is stalling near old highs. We are slipping into the frequently listless summer trading season and those with cash seem uninterested in initiating new positions near these record highs. Without new money, prices will invariably weaken and we will slip back into the heart of the 1,800/1,900 trading range. Four months of sideways chop is refreshing the market and building a base for the next move higher. While flat bases typically take longer to form than more dramatic selloffs, we’re largely unchanged since the start of the year and four months is a decent consolidation, especially one that includes two one-hundred point selloffs. While it seems likely this market will continue resting through the summer doldrums, there is no reason we couldn’t get an early start to a fall rally. The complete lack of excitement surrounding Friday’s blowout employment headlines is a clear signal this market is not poised to explode higher. For bulls that means this is a better place to take profits than add new positions. Swing-traders could use this lack of strength as shorting opportunity if the market stumbles back into the heart of the trading range. But any short trade here is simply exploiting the natural ups and downs, not getting ahead of a market crash. We are in a range bound market and both sides should take profits early and often.